Adventism is forceful that God succumbed to Israel’s pressure for a king, that He had never intended for them to have a king. To be sure, Israel was apostatizing and wanting to have a king like the other nations. In fact, when God instructed Samuel to anoint Saul, He told Samuel that they had not rejected Samuel’s leadership; they had rejected God’s sovereignty over them (1 Sam. 8:7). Nevertheless, in spite of the fact that Israel rejected God’s leadership and authority, God had intended to establish a king in Israel. In fact, the entire paradigm of the Old Testament was that David’s throne would never cease to have a king on it. A son of David would forever reign on David’s throne. “When you come to the land that the LORD your God is giving you, and you possess it and dwell in it and then say, ‘I will set a king over me, like all the nations that are around me,’ you may indeed set a king over you whom the LORD your God will choose. One from among your brothers you shall set as king over you. You may not put a foreigner over you, who is not your brother. Only he must not acquire many horses for himself or cause the people to return to Egypt in order to acquire many horses, since the LORD has said to you, ‘You shall never return that way again.’ And he shall not acquire many wives for himself, lest his heart turn away, nor shall he acquire for himself excessive silver and gold. “And when he sits on the throne of his kingdom, he shall write for himself in a book a copy of this law, approved by the Levitical priests. And it shall be with him, and he shall read in it all the days of his life, that he may learn to fear the LORD his God by keeping all the words of this law and these statutes, and doing them, that his heart may not be lifted up above his brothers, and that he may not turn aside from the commandment, either to the right hand or to the left, so that he may continue long in his kingdom, he and his children, in Israel” (Deuteronomy 17:14-20). God not only foretold that the children of Israel would want a king like the other nations, but He said that He Himself would choose who they set over themselves, and He gave some basic rules for the kings. Each was to hand-write a copy of the Torah when he became king so he could read and learn from it. Kings were not to amass many horses or take the people back to Egypt for the purpose of acquiring horses or wealth. Moreover, they were not to acquire many wives or excessive wealth. They were to be humble. “Judah, your brothers shall praise you; your hand shall be on the neck of your enemies; your father's sons shall bow down before you. Judah is a lion's cub; from the prey, my son, you have gone up. He stooped down; he crouched as a lion and as a lioness; who dares rouse him? The scepter shall not depart from Judah, nor the ruler's staff from between his feet, until tribute comes to him; and to him shall be the obedience of the peoples. Binding his foal to the vine and his donkey's colt to the choice vine, he has washed his garments in wine and his vesture in the blood of grapes. His eyes are darker than wine, and his teeth whiter than milk (Genesis 49:8-12). But that same night the word of the LORD came to Nathan, “Go and tell my servant David, ‘Thus says the LORD: Would you build me a house to dwell in? I have not lived in a house since the day I brought up the people of Israel from Egypt to this day, but I have been moving about in a tent for my dwelling. In all places where I have moved with all the people of Israel, did I speak a word with any of the judges of Israel, whom I commanded to shepherd my people Israel, saying, “Why have you not built me a house of cedar?”’ Now, therefore, thus you shall say to my servant David, ‘Thus says the LORD of hosts, I took you from the pasture, from following the sheep, that you should be prince over my people Israel. And I have been with you wherever you went and have cut off all your enemies from before you. And I will make for you a great name, like the name of the great ones of the earth. And I will appoint a place for my people Israel and will plant them, so that they may dwell in their own place and be disturbed no more. And violent men shall afflict them no more, as formerly, from the time that I appointed judges over my people Israel. And I will give you rest from all your enemies. Moreover, the LORD declares to you that the LORD will make you a house. When your days are fulfilled and you lie down with your fathers, I will raise up your offspring after you, who shall come from your body, and I will establish his kingdom. He shall build a house for my name, and I will establish the throne of his kingdom forever. I will be to him a father, and he shall be to me a son. When he commits iniquity, I will discipline him with the rod of men, with the stripes of the sons of men, but my steadfast love will not depart from him, as I took it from Saul, whom I put away from before you. And your house and your kingdom shall be made sure forever before me. Your throne shall be established forever.’” In accordance with all these words, and in accordance with all this vision, Nathan spoke to David. Then King David went in and sat before the LORD and said, “Who am I, O Lord GOD, and what is my house, that you have brought me thus far? (2 Samuel 7:4-18). The Messiah was to be the Son of David, and God foretold His birth in the Old Testament through His prophets. The monarchy was not God’s plan B. It was always His intention. Sunday’s lesson introduces King Josiah, one of the few good kings of Judah. His father and grandfather were wicked, but Josiah convicted when a copy of the book of the Law was found in the temple and read to him. the book of the Law was the Torah, the entire Pentateuch and the word of the Lord. God’s word convicted Josiah of Judah’s sin. The lesson makes the point that Josiah’s reforms were two-fold: ridding Judah of the altars and high places and the priests for the false gods Judah had been worshiping, and keeping God commandments, testimonies, and statutes”. The implication is that the return to keeping the commandments introduced the blessings and goodness that characterized Josiah’s reign. In fact, the law never caused people to be good. Josiah order Judah to keep God’s word and laws because he was convicted by the sin of the nation. He was convicted that they had strayed from God. His response to God’s word was a soft heart and a desire to honor God. Keeping the commandments was not the means to his “good king” status nor the means to Israel’s blessings during his reign. Rather, Josiah was a good king because he honored God’s word as God’s personal communication with him, and he responded to God’s work on his heart through His word. How then will they call on him in whom they have not believed? And how are they to believe in him of whom they have never heard? And how are they to hear without someone preaching? And how are they to preach unless they are sent? As it is written, “How beautiful are the feet of those who preach the good news!” But they have not all obeyed the gospel. For Isaiah says, “Lord, who has believed what he has heard from us?” So faith comes from hearing, and hearing through the word of Christ” (Romans 10:14-18). Having purified your souls by your obedience to the truth for a sincere brotherly love, love one another earnestly from a pure heart, since you have been born again, not of perishable seed but of imperishable, through the living and abiding word of God” (1 Peter 1:22-23). And if you call on him as Father who judges impartially according to each one's deeds, conduct yourselves with fear throughout the time of your exile, knowing that you were ransomed from the futile ways inherited from your forefathers, not with perishable things such as silver or gold, but with the precious blood of Christ, like that of a lamb without blemish or spot. He was foreknown before the foundation of the world but was made manifest in the last times for the sake of you who through him are believers in God, who raised him from the dead and gave him glory, so that your faith and hope are in God (1 Peter 1:17-21). We know God through the Lord Jesus. God’s word reveals the truth of our depravity and our need of a Savior, and it also reveals the truth about the Lord Jesus. When we believe and trust Him, we are born again, and we know God. We do not get to know God through good works; we know God through believing Jesus. Then they said to him, “What must we do, to be doing the works of God?” Jesus answered them, “This is the work of God, that you believe in him whom he has sent” (John 6:28-29). For by grace you have been saved through faith. And this is not your own doing; it is the gift of God, not a result of works, so that no one may boast. For we are his workmanship, created in Christ Jesus for good works, which God prepared beforehand, that we should walk in them (Ephesians 2:8-10). The good works we do are God’s works which He appointed for us to do in advance. He brings us into His story, and He gives us His work to do! Tuesday’s lesson camps on the short life of Jehoiachin and explains how his reign was cut short by the Babylonian invasion of 561 BC. 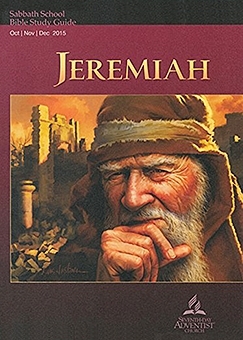 Then the lesson cites Jeremiah 29:1-14 and comments on verse 11, “‘For I know the plans I have for you,’ declares the Lord, ‘plans to prosper you and not to harm you, plans to give you hope and a future.’” The lesson ends by asking what promises we can claim from the Lord right now for a future and a hope. God’s promises to the nation of Israel, of which Jeremiah 29:11 is one, cannot be applied out of context to people of all ages. God’s promises to Israel in the context of His covenant with them are for them. Truly, truly, I say to you, whoever hears my word and believes him who sent me has eternal life. He does not come into judgment, but has passed from death to life (John 5:24). God’s promises for a future, for salvation, for blessing and provision of all our needs only apply those who have placed their entire trust in Jesus. Adventism cannot be compared to Judah. Judah was the southern kingdom of the nation of Israel. Scripture is full of the story of God’s choice of Israel for His own people from whom the Savior would come. Adventism, however, is not “God’s people”. Adventism is only one of a plethora of religious movements which developed out of the Millerite movement. It is not truly Christian; it believes in a weak and fallible Jesus and a false gospel. It has an extra-biblical prophet, and its central doctrine, the investigative judgment, is completely unbiblical. No one, including Adventist scholars who know the biblical languages, can derive the investigative judgment from Scripture. Adventism, unlike Israel and the nation of Judah, was not raised up by God to proclaim an end-time message. It is proclaiming a unique message, to be sure—the investigative judgment is Adventism’s only unique doctrine; nevertheless, this doctrine is unique because it is the product of the founders of Adventism. It is not a biblical teaching. It is illegitimate for anyone to look at Scripture and say they are God’s current replacement of Israel. Adventism especially cannot claim to be God’s last day movement because its doctrines are not biblical. No group that teaches a different gospel and an incomplete atonement can claim to be God’s movement. God does not raise up for Himself a movement that is antithetical to the doctrine of the atonement and justification in Christ’s blood. The problem with this statement is that God’s promises to remove Israel from exile at the appointed time and to restore Israel in His own time were not conditional promises. These promises were unconditional; God would do what He said He would do, and His fulfillment of His promises did not hang on Israel’s performance or obedience. They were certain because God said He would do them. Adventism teaches that God’s promises depend upon human obedience and cooperation. In the cases of His promises which are not connected to a covenant that depends on human participation, however, God’s word is certain. We cannot thwart God’s plan or alter His timetable. He is sovereign over all creation. Today’s lesson draws on Ellen White’s comments again, and she refers to “Heaven’s willingness to forgive and to save.” She consistently teaches that God’s grace is dependent upon our willingness to receive it. She completely misses the fact that Scripture teaches that God must intercept our spiritual death and bring us to receive the truth about Jesus. No one can come to me unless the Father who sent me draws him. And I will raise him up on the last day. It is written in the Prophets, ‘And they will all be taught by God.’ Everyone who has heard and learned from the Father comes to me—not that anyone has seen the Father except he who is from God; he has seen the Father (John 6:44-46). The lesson reminds the readers that they have the Bible and the Spirit of Prophecy, a “wonderful gift”, that helps confirm Heaven’s “willingness to forgive and to save”. This statement reveals that Adventism is not biblical Christianity. Jesus is God’s final word (Heb. 1:1-3), and Ellen White consistently taught a different gospel and a different Jesus. Instead of reading Ellen White and attempting to harmonize Scripture with her commentary, just read the Bible. It means what it says; the normal rules for reading literature apply to reading the Bible. Take the words at face value. We are born dead in sins, and while we were sinners Christ died for us, causing us to be made alive while we were still sinners. But God sat us with Christ in heavenly places when we believed. Scripture alone is all we need! Let your extra-biblical prophet go; the Lord Jesus is all we need! Copyright 2015 BibleStudiesForAdventists.com. All rights reserved. Revised October 12, 2015. This website is published by Life Assurance Ministries, Camp Verde, Arizona, USA, the publisher of Proclamation! Magazine. Contact email: BibleStudiesForAdventists@gmail.com.